The main concern of this project is Markovian modelization in early vision. We consider low level vision tasks in a common framework, called image labeling, where the problem is reduced to assigning labels to pixels. Our approach is probabilistic, using Markov Random Fields (MRF) and Bayesian estimation, in particular Maximum A Posteriori (MAP) estimation. The advantage of MRF modelization is that a priori information can be "coded" locally through clique potentials. We also discuss pyramidal MRF models, which reduce the computing time and increase the quality of final results. Parameter estimation is an important problem in real-life applications in order to implement completely data-driven algorithms. We apply some methods to the estimation of monogrid model-parameters and propose a new algorithm for the hierarchical model. All MRF models result in a non-convex energy function. The minimization of this function is done by Simulated Annealing or deterministic relaxation. We also investigate the possible parallelization techniques of optimization algorithms. Our main result is a new hierarchical MRF model and a Multi-Temperature Annealing algorithm proposed for the energy minimization of the model. The convergence of the MTA algorithm has been proved towards a global optimum in the most general case, where each clique may have its own local temperature schedule. A demo program implementing the supervised monogrid model is also available for download. 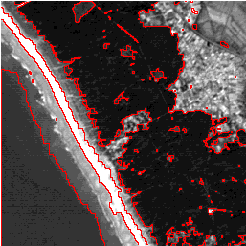 Following are some results on synthetic as well as on real satellite images. 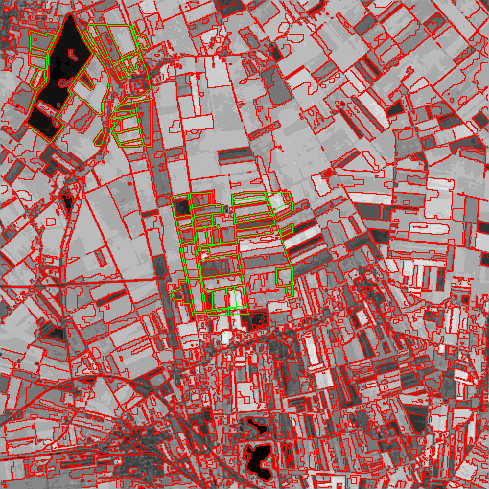 On the latter ones, red contours show region boundaries detected by our algorithm while green contours, where available, show the ground truth boundaries specified by an expert. On the synthetic image, we also show the evolution of Simulated Annealing while minimizing the MRF energy.